HP Ultrium tape technology has been designed to deliver exceptional reliability and performance at the lowest cost per GB. The Ultrium format builds on the best of existing technologies; open standards increase innovation and widen customer choice in terms of performance, capacity, and form factor. 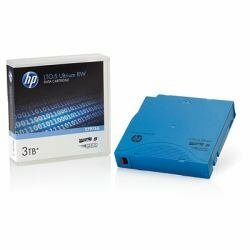 Backed by HP's exhaustive media qualification process, HP Ultrium data cartridges support all HP StorageWorks and non HP Ultrium tape devices. Assuming 2:1 compression, the latest fourth Generation products minimize interruption to network and SAN backup by being capable of protecting 1TB/hour of data and storing up to 3.0 TB on one piece of media (almost double the capacity of HP LTO-4 Ultrium tapes).